← That baby don’t look like me. So today I had an EYE OPENING experience. Literally. I went to work out at Pure Barre. I have been having problems with my eyes more than normal lately. My contacts won’t stay in, especially if I sweat and it runs down into them. So today, I opted to wear my giant thick glasses to class. With half of the exercises I would have to take my glasses off – which was fine because I have a lot of them memorized. At one point, I had them off and looked around the room at the other women and realized that if the women hadn’t been moving, I would NOT be able to distinguish them from just objects in the room. It’s that bad. It’s scary to think I couldn’t see a human in the same room as me. It’s scary to wonder if my vision continues to get worse. In the state of Alabama I am on the brink of LEGALLY BLIND. In 5 years I think that I will be legally blind officially. That’s crazy stuff. It’s scary to think my contact could fall out during a car ride, and I wouldn’t be able to drive home the rest of the way! 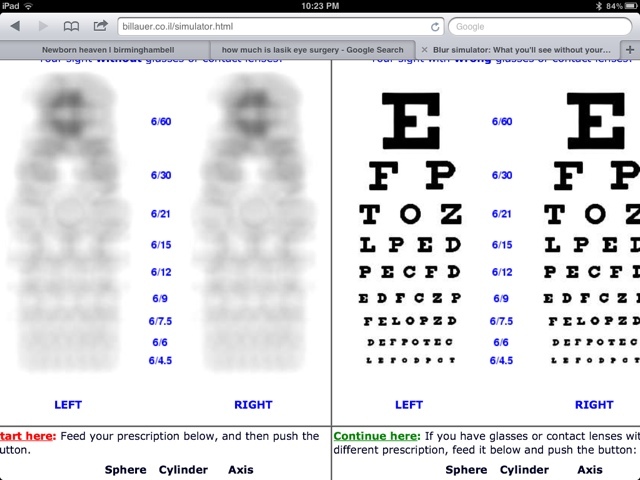 This is what my vision looks like on the left without my glases. The right is what it should look like. B. My eyes were so quickly declining, I needed to wait until I reached a plateau so that my eyes wouldn’t change back quickly.